These domestic and foreign policy issues divided both the country and the Kennedy administration. 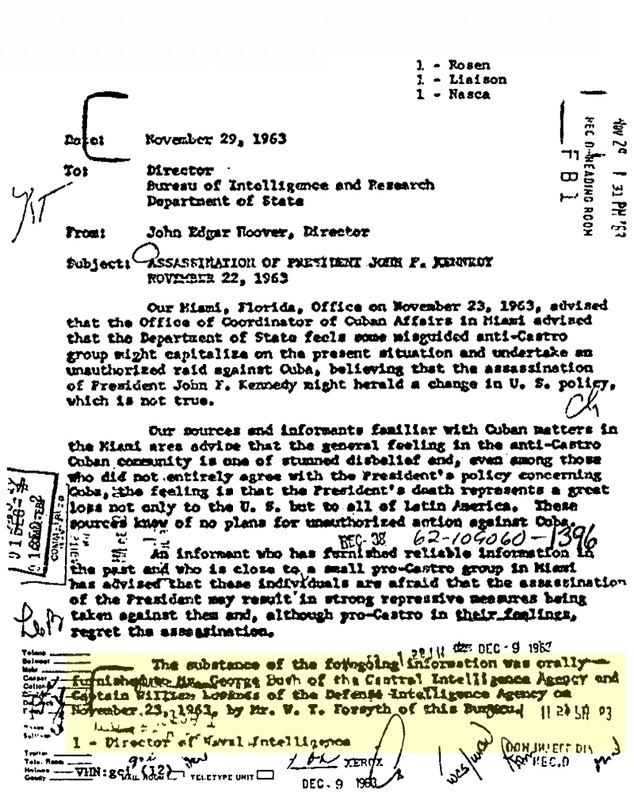 There were many individuals and groups - Cuban exiles, mob figures, virulent racists, CIA and Pentagon hardliners - with a motive for murder. Over the years, document declassifications and personal accounts have added to the picture of a presidency beset from within and without. But the question remains with no consensus: which of these motives, if any, turned into an actual murder plot to assassinate President Kennedy? ASSASSINATION: President Kennedy was murdered while riding in a motorcade through Dealey Plaza in Dallas at 12:30 PM CST on Friday, November 22, 1963. Several photos and films captured the assassination, including the famous Zapruder Film. JFK was rushed to Parkland Hospital, where a tracheostomy and other efforts failed to keep him alive. After he was pronounced dead around 1 PM, his body was removed against the wishes of Texas authorities and flown back to Washington aboard Air Force One with his wife Jackie and his successor, President Lyndon Johnson. An autopsy was performed at Bethesda Naval Hospital, and he was buried at Arlington National Cemetery on Monday the 25th. Meanwhile, Lee Harvey Oswald, a former Marine and defector to the Soviet Union, was arrested around 2 PM at the Texas Theatre in the Oak Cliff suburb of Dallas and charged with murdering a police officer named J.D. Tippit. Protesting that he was "a patsy," Oswald was paraded in front of the world's gathering cameras and accused of murdering President Kennedy as well. Oswald's defection and Marxist sympathies were quickly covered in the nation's newspapers, in part because his curious pro-Castro activities during the summer in New Orleans had brought him to the attention of local Cuban exiles. Oswald was interrogated throughout the weekend, though no recordings or transcriptions were made. During an intended transfer to county facilities on Sunday morning the 24th, Oswald was shot and killed on live television in the basement of the Dallas Police station. His murderer was a local nightclub owner with connections to organized crime named Jack Ruby. MORE TO COME! This is a show William Cooper did on October 10, 1999 on J.F.K., Jr.